If you are experiencing the same thing that I am experiencing that is not the emergence of comments on WordPress blogs and pops up comments are closed, maybe you can try my experience to overcome the WordPress comments that do not show up or comments are closed. This incident I experienced after using Disqus comments in WordPress. Since I use Disqus comments, then I disable WordPress default comments from the WordPress dashboard. Yet yesterday I tried to reuse WordPress comments and deleted Disqus comments and re-enabled them via the WordPress dashboard >> Setting >> Discussion, and the happening comments do not want to appear and appear posts comments are closed in some posts. Comments appear only on newly created post after the comment is re-enabled. After the fiddling here and there, finally, the comments can reappear in all posts. If you are experiencing the same thing, please try some of the things below. 1. Try looking for CSS styles that may hide comments like below. If there is, please remove the CSS. 2. Please go to the Posts section. 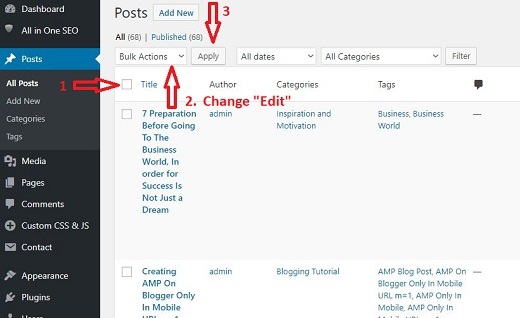 Check the box on the edge of Title writing then click toggle Bulk Actions and select Edit then click Apply button. Then on the page that appears next please click toggle No Change on Comments and select Allow and then click Update. Perform the above steps on all posts, usually, one page contains 20 posts, so do for 20 posts then da continue until all posts updated. Then please check the post to make sure the comment column appears in the posting page. So many of these articles about Overcoming WordPress Comments Not Appearing Or Comments Are Closed, hopefully useful.